In recent years the issue of debt has become raw meat for rabid politicians. The explosion of college debt, the predatory lending practices on mortgages leading up to the sub-prime crisis, credit card debt in a world where credit card marketing is ubiquitous—all those are real issues that can affect anyone. And the difference between getting this one right or wrong can lead to tens or even hundreds of thousands of dollars. Quick note: This is an investing blog, not a personal spending blog, so I don’t want to get too much into the question of “should you incur debt?” There are hundreds of blogs out there already that do that much better than I (my personal favorite is www.mrmoneymustache.com). This post is going to be focused on looking at debt from an investment perspective. Some people think of debt as either good or bad, like it is the good cholesterol or bad cholesterol you see on your annual blood test. I think that glosses over some of the most important points. Instead I look at debt solely by how expensive it is. What is its interest rate? Basically, if you can invest your excess cash at a higher return than the interest rate on your debt, then you should invest; if you can’t, then you should pay off your debt. That seems pretty reasonable, right? Based on that, the higher the interest rate on your debt, the more quickly you should pay that off. Obviously those are just examples, and they can vary a lot, but that’s a good starting point. When you think about paying off debt, basically you’re getting a “guaranteed return” on your investment of the interest rate you were paying. Right now, US bonds tend to have an average return in the 4-5% range; that certainly isn’t guaranteed, but that gives you a sense of what a “safe investment” can yield. Stocks tend to have an average return in the 6-8% range, but sometimes it’s much higher and other times it’s much lower. Now think about paying off debt. Let’s say you own money on a loan that has 10% interest, and you have $1000 that you could either invest in stocks or use to pay off your loan. If you invested it, let’s say you bought stocks; on average you would get 6-8% but that could really vary from year to year. On the other hand, if you put the $1000 towards that loan, you would be guaranteeing yourself a 10% return because you wouldn’t be charged interest on that money. This seems like a no-brainer, right? A 10% sure-thing is much, MUCH better than investing in the stock market. So this is the approach we’re going to use when we look at debt. Credit card debt is pretty universally terrible for one’s personal finances. The interest rates are usurious and there is no investment that can come close to the double-digit interest rates on most cards. Some cards offer low introductory rates which change the calculations, but those are temporary. As a general rule, paying off all your credit card debt should be the highest priority. Auto loans throw in an added complication. Some auto loans are on the high side, let’s say anything over 5%. If you pay those off, you’re getting a guaranteed 5% return which is better than any other “guaranteed” return, so that makes sense. This is the case with many new car loans and nearly all used car loans. However, some car companies offer “below-market” interest rates auto loans to induce you to buy. Last year, the Fox family bought a new Honda Fit, and we were offered a 0.9% interest rate to finance the car for 5 years. If you compare 0.9% to what we could expect on average with stocks or bonds, we’re much better off taking the loan and investing the money we would have used to buy the car outright. Also, you can think of a subsidized loan as something of value that the car company is offering. If you don’t use it, you’re passing up that value. However, if you do use it, even if you have the money to pay off the car in full, the value of that “subsidy” might be worth a few thousand dollars. The Fox family has very little debt, but we do have an auto loan. We had the money to buy the car outright, but we’ve taken advantage of the really low interest rate because we’re getting more by investing that money in the market. Student loans get a little more complicated because the interest on them is tax deductible, and that’s an important consideration. So for example, if your student loan is at 5% (current rate for new Stafford loans) while your marginal tax rate is 40%, you’re effectively paying only 3% (5% *(1-40%)). Obviously the decision to pay off your loan right away or invest that money is significantly impacted by that difference. You’d probably want to pay off a 5% loan right away, but a 3% loan might be low enough to make it worthwhile to invest the money. There is a lot of gray area here, but I would generally choose to invest the money and just make the regular loan payments. Mortgage is usually the biggest loan people have (as we covered here). Similar to student loans, interest on mortgages is usually tax deductible, so really lowers your effective rate. Also, mortgages tend to be subsidized by the government, so they often have interest rates that are lower than any other type of loan. 30-year fixed loans are currently at about 3.7% which is super low. Add on the tax-deductibility benefit and your effective rate can drop as low as 2%. If you’re paying 2% on a loan that will last decades, the math and historical averages definitely say that you should pay off the loan over time and invest any excess cash. Of course, you can take this to the extreme and get an I/O loan (an “interest only” loan where your payment is only interest and your principal never goes down). Some people do the calculations above and decide “if a little is good a lot is better”. Mathematically, I think they’re right. However, the Fox family doesn’t do this, less because of logical reasons (the logic says pay off as little as you can), but more because of emotional reasons. I like the idea that over time I am paying off the loan and when our tails turn from red to gray, our house will be paid off. 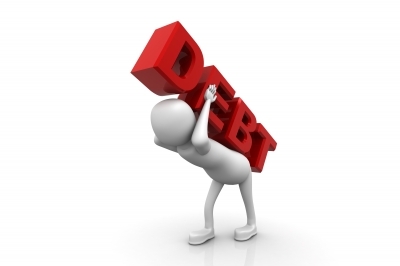 Obviously there are a lot of considerations when it comes to what to do with debt. Pretty universally everyone agrees that credit card debt and most auto loans are way too expensive and should be paid off as soon as possible. However, as you move down the spectrum to student loans and definitely home mortgages, it becomes more complicated. Some people have the attitude that a healthy portfolio has no debt, and you should focus on debt reduction before starting investments. They set goals for themselves to be mortgage free ASAP. That’s a noble goal, and one I totally get. If you don’t have debt you feel more secure, you own your stuff outright, etc. Those are very valid emotional responses, but the math says that’s the wrong thing to do. I take the middle ground on this—the only debt we have is a subsidized car loan and a mortgage. The car loan is pretty small, so let’s not even count that. For the mortgage (currently we owe about $500k) we could have paid it off over the past 5 years by scrapping together every penny we had and pretty much saved nothing (including not doing things like our 401k—yikes!!!). Today we wouldn’t have a mortgage which would be nice, but we wouldn’t have been able to take advantage of a pretty nice bull run the last five years. Taking all that money and investing it has probably netted us a $400k profit. That’s almost double what we would have had otherwise. Of course, the past five years have been a really good time to be an investor, plus interest rates have been at historic lows, so that makes a perfect storm for it being to your advantage to invest rather than pay off your mortgage. But remember that it’s a numbers game, and over the long term stocks return more than what you’re paying with today’s interest rates. I think alot of baby boomers will find this subject timely and interesting. Great advice, as always, Stocky!